"Violent" Johnny Depp became "the Monster" on drugs and booze, then beat, strangled and tormented his then-wife Amber Heard, she alleges in a new, harrowing court filing. Heard, who was married to the Pirates of the Caribbean star for just over a year until she filed for divorce in May 2016, claims in horrific detail Depp repeatedly hit her, ripped out her hair, choked and nearly suffocated her in a Virginia court filing in response to his $US50 million defamation lawsuit against her. Depp's lawsuit relates to a 2018 op-ed by Heard for the Washington Post where she describes being the victim of domestic abuse but does not mention him in the piece. His lawsuit claims she insinuates he was the abuser and Heard's allegations are a "hoax". Amber Heard and Johnny Depp married in 2015. 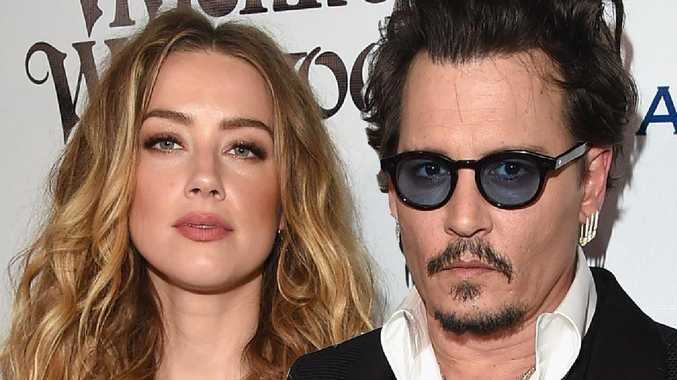 Heard states she began dating Depp in early 2012: "About a year into our relationship, I began to witness Johnny abusing drugs and alcohol … On some occasions, when Johnny simultaneously used both illegal narcotics and prescription medications I have had to get him medical attention. Whenever he was using, I worried for both of us. He would become a totally different person, often delusional and violent. "We called that version of Johnny, 'the Monster'. On the morning they boarded a private jet to fly from Boston to LA in May 2014, Heard claims in her court documents Depp appeared to be already drunk and was clutching a bottle of champagne. "On the flight, Johnny ordered the flight attendants to give him an oxygen tank and drank heavily. Johnny's handlers told me that he was upset that I was filming a movie with a romantic scene with James Franco the day before. Soon, Johnny began to throw objects at me. Instead of reacting to his behaviour, I simply moved seats. That didn't stop him. He provocatively pushed a chair at me as I walked by, yelled at me, and taunted me by yelling out the name 'James Franco'. Depp allegedly apologised in a later text message, writing, "Once again, I find myself in a place of shame and regret. Of course, I am sorry. I really don't know why or what happened. 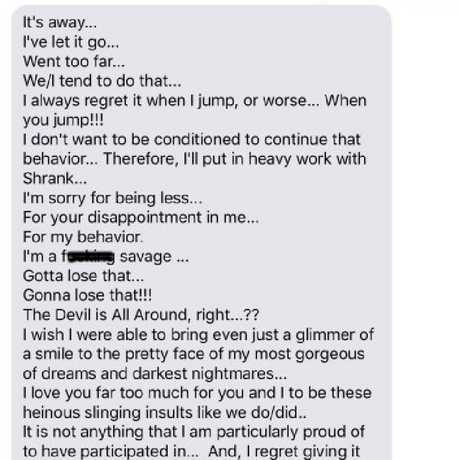 But I will never do it again." His message continued, "My illness somehow crept up and grabbed me … I must get better … Again, I am so sorry, so sorry. … I love you and I feel so bad for letting you down." Heard claims Depp's assistant Stephen Deuters also messaged her, saying Johnny "was appalled. When I told him he kicked you, he cried". Deuters adds, "He's a little lost boy. And needs all the help he can get." The couple married in February 2015. 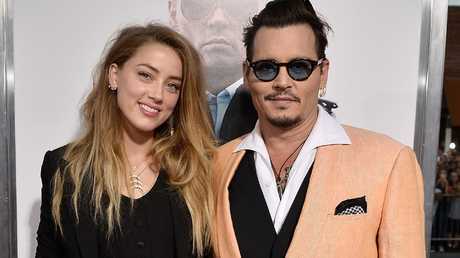 Yet, just a month into their marriage, Heard goes on to allege that, in March 2015, Depp - who was supposed to be clean at the time - went on a three-day bender on MDMA/ecstasy in Australia. "Johnny told me that I had not explicitly forbidden him from taking ecstasy. The argument heated up, and Johnny pushed me, slapped me and shoved me to the ground before I retreated to a locked bedroom." The next morning, "I went downstairs to find that Johnny was still awake, and that he had stayed up all night, having taken about eight MDMA pills. He was also drinking again. We got into a fight that Johnny made physical, and I barricaded myself in one of the rooms. That didn't stop Johnny from busting through the door of the room I was in. "By nightfall, Johnny had hit me multiple times, shoved and pushed me to the ground, choked me and spit in my face. "That night, Johnny shoved me into a ping pong table that collapsed underneath me. Johnny threw bottles through the window panels of a glass door, breaking two panes, and leaving glass everywhere. Johnny then grabbed me, gripping my body and nightgown. He tore the nightgown off, and at some point, I was naked and barefoot, covered in alcohol and glass. "Johnny grabbed me by my hair and choked me against the refrigerator in the kitchen. I tried to stand myself up but I was sliding around the glass-strewn floor and countertop. Johnny threw me away from him, and I tried to run away as Johnny continued to throw objects and alcohol at me. Nicole Kidman, Jason Momoa and Amber Heard at the Aquaman premiere last year. "In one of the most horrific and scariest moments of this three-day ordeal, Johnny grabbed me by the neck and collarbone and slammed me against the countertop. I struggled to stand up as he strangled me, but my arms and feet kept slipping and sliding on to the spilled alcohol and were dragged against the broken glass on the countertop and floor, which repeatedly slashed my feet and arms. Scared for my life, I told Johnny, 'You are hurting me and cutting me'. Johnny ignored me, continuing to hit me with the back of one closed hand and slamming a hard plastic phone against a wall with his other until it was smashed into smithereens. While he was smashing the phone, Johnny severely injured his finger, cutting off the tip of it … Once I was able to get away, I barricaded myself in an upstairs bedroom. Heard states the actor was finally hospitalised and alleges she was left with "a busted lip, a swollen nose, and cuts all over my body … to this day, I still have scars on my arms and feet from this incident". Heard describes in the court documents how in March 2015 she punched an enraged Depp, allegedly fearing he would push her younger sister Whitney down the stairs at his home in LA. She states, "He began to destroy personal property all over the house, including my belongings in my closet. … Johnny lunged to hit me, Whitney placed herself between us. Johnny turned his attention to Whitney, who was standing on the top of a flight of stairs, and moved on her. Acting in defence of my sister, as I was scared for her physical safety, I punched Johnny in the face to draw his attention away from her. That was the only time I ever hit Johnny." She also includes a transcript from her divorce deposition: "He was about to push my sister down the stairs … I acted defensively (for) her life." Heard claims "The Monster" returned next during an August 2015 trip to Thailand and Malaysia. "While on the Eastern Oriental train, Johnny picked a fight with me and started hitting and pushing me against a wall by grasping my throat and holding me there. I remember being afraid that Johnny might not know when to stop, and that he might kill me." Depp allegedly spiralled further out of control in December 2015 at their LA apartment. "Johnny picked another fight with me. He threw another decanter at me, knocked items around the room and punched the wall. He slapped me hard, grabbed me by my hair and dragged me from a stairwell to the office to the living room to the kitchen to the bedroom and then to the guest room. In the process, he pulled large chunks of hair and scalp out of my head. Amber Heard filed for divorce after 15 months of marriage. "Hoping to avoid the violence, I tried to calm Johnny down, and then went upstairs to try to remove myself from the situation. Johnny followed me, hit me in the back of my head, grabbed me by my hair again, got in front of me on the steps, and then dragged me by my hair up the last few steps. At the top of stairs, Johnny shoved me twice, which made me fear I would fall. I told Johnny that he had broken my wrist in an attempt to get him to stop. "He reeled back and headbutted me in my face, bashing my nose, which immediately began bleeding, sending searing pain through my face. I instantly started tearing up, and I thought that I would have to go to the hospital. I told Johnny I wanted to leave him, and that I would call the police if he ever touched me again. When I began to walk away toward the guest apartment, he responded by pushing me, then grabbed me and pulled me from one room to the next, gripping me by my hair. 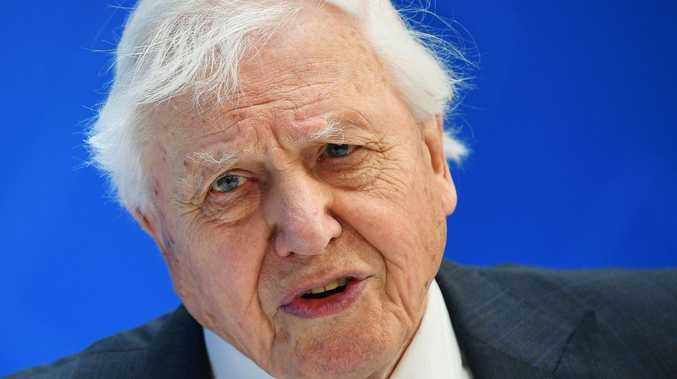 "By the time Johnny had dragged me into the upstairs office, I told Johnny that I was leaving him, since I could not put up with his behaviour any longer. Johnny reacted by grabbing me by my throat, pushing me down to the ground and punching me in the back of my head. He grabbed me by my hair, slapping me in the face and screaming at me something like, 'I f***ing will kill you - I'll f***ing kill you, you hear me?' There were chunks of my hair everywhere and indentations in the carpet where I was dragged. "The fight continued onto a bed. Johnny got on top of me with his knee on my back and the other foot on the bed frame while repeatedly punching me in my head, and he screamed - as loudly as I've ever heard him scream - 'I f***ing hate you' over and over again. The bedframe splintered under the weight of the pressure of his boot. Johnny hit me with his closed fists, and I remember being unable to hear myself screaming because he had pushed my face into the mattress. I screamed as loudly as I could, hoping Johnny would realise he was severely hurting me. "For a while, I could not scream or breathe. I worried that Johnny was in a blacked-out state and unaware of the damage he was doing, and that he could actually kill me. "Broken glass and chunks of hair were strewn across the downstairs of the penthouse … Johnny also had written a message on the countertop in our kitchen in gold sharpie that said, 'Why be a fraud? All is such bullsh*t.'"
Heard resolved to leave Depp for good and filed a request for a domestic violence restraining order after he allegedly attacked her again in May 2016, first grabbing her phone. "He wound up like a baseball pitcher and threw the phone in my face, as hard as he could. I yelled, 'You hit my face', and started to cry. … Johnny grabbed my hair and started to slap, shake and yank me around the room while I continued to scream." Heard alleges their neighbour heard her screams, came into their apartment, threw herself in between them and begged Depp - who was screaming at Heard, "Amber get the f**k up" - to stop. Heard claims, "Johnny smashed various objects around the house with a wine bottle as he left. … Johnny smashed more items in the hallway, spilled wine everywhere and kicked a hole in a solid door." He then allegedly demanded to be let into another apartment where Heard's possessions were kept. "Johnny destroyed everything he could and chased (make-up artist) Liz Marz out of the penthouse carrying a wine bottle." Heard adds after reporting the alleged abuse, and following their divorce in January 2017, some people have claimed she faked her injuries. "Many people called me a liar (without ever hearing my story). I was dropped from a global fashion brand's upcoming campaign. I lost a part for a movie in which I had already been cast. People I have never met or spoken to threatened me with violence. I received so many death threats I had to change my phone number on a near-weekly basis. "People accused me of having abused Johnny. That simply is not true. I never attacked Johnny other than in self-defence (and in defence of my little sister). I have never physically abused anyone. I know what that does to people." She adds, "Instead, I have attempted to promote good in the world and to advocate an end to domestic violence. I have sought to use my public persona to speak out on an issue that was extremely meaningful to me and millions of other women and men every year. 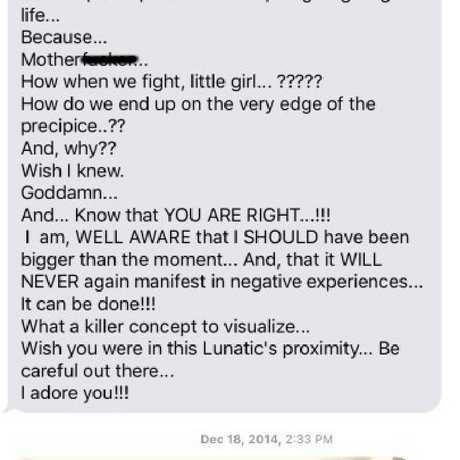 I have spoken out about violence in public, but I have always avoided specifically referencing Johnny, or recounting his violence against me, not only because I wanted to move past that phase of my life but also because I was constrained by the terms of a strict confidentiality agreement that Johnny had insisted upon as part of our divorce settlement." Depp's reps didn't immediately comment. In Depp's $US50 million defamation lawsuit, his lawyers said: "Mr. Depp never abused Ms. Heard. Her allegations against him were false when they were made in 2016. They were part of an elaborate hoax to generate positive publicity for Ms Heard and advance her career." Heard's op-ed's "implication that Mr Depp is a domestic abuser is categorically and demonstrably false," his lawyers state, and the domestic abuse allegations cost him the role of Jack Sparrow in the Pirates of the Caribbean franchise.